Awww. 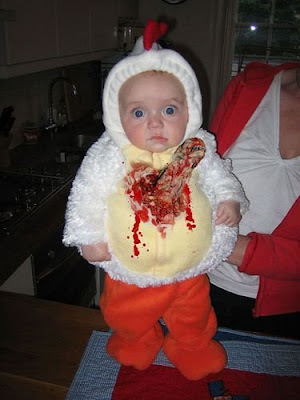 Look at the cute baby in her homemade Alien costume. I've been thinking that it's a good thing I don't have any children just yet because I don't know if I'm up for the pressure of creating a clever costume for Halloween. I overhear conversations at work with mothers plotting about creating the best costume for their kids and it frightens me. I suppose if I wanted to participate, I could dress up my beagle. But I doubt she'd like the attention. But I don't remember this whole costume dilemma being such a big deal when I was a little girl. My mother never came up with anything clever for me. She liked to dress me up as a gypsy which involved plastering my face in her makeup and ripping up a sweatshirt to look like I was walking around in rags. I have the pictures to prove it. When I was young, it was perfectly acceptable to go to Zayres and buy a costume packaged in a cardboard box. You'd open it up and there would be a plastic mask that you'd secure to your head with a very tight yet always flimsy rubber band that drove you crazy the whole night of Trick or Treating. If you were on the husky side, forget it: the cheap plastic pants that came with the costume were simply dreadful. These days dressing your kid up has become an art form and I don't think the youth of today would be caught dead wearing store bought costumes. I suspect Target tries to really get in the spirit of the holiday by catering to single moms. Walking through their aisles of costumes, I laugh when I see these costumes hung on hangers made out of stuffed animal fabric. It's like 1975 all over again except more expensive. Maybe my mom knew what she was doing back then. She knew for me it wasn't about impressing the neighbors with well thought out costumes. Really it was about slapping something on me that passed as a costume so I could get out there to collect the most candy possible. And to me that's what Halloween is really about-the candy. Buy me a pomegranate will you? I will pay you for it.....maybe more than you paid for it......I am begging you.......I don't want to meet you at the counterand be blocked!